Tempel Lipizzans takes pride in breeding to the standards that were developed for Lipizzans at the time the breed was established. Now considered an endangered domestic breed, we take careful measures to preserve bloodlines, correct conformation, temperament and trainability that is the noble stamp of this breed. We have regular visits from evaluators from the Lipizzan International Federation to continually assess the strength of our program. Click on one of the headers below to learn more. 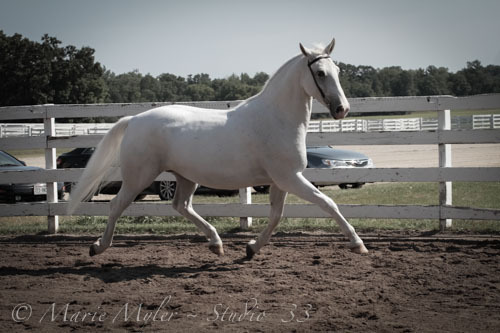 Each year, Tempel Lipizzans is proud to present several lovely, high quality horses for sale. These horses are excellent dressage prospects with the trainability and temperament to succeed up to the highest levels in dressage. Traditionally, Lipizzans were also used for driving. We maintain a driving training program and we can advise on the best horses for this discipline. Our sales page is currently under construction. Check back soon for an updated sales list. Currently, we are offering four stallions standing at stud. Our experienced staff can help you pick the best match for your mare. One of the hallmarks of the Tempel Lipizzans is its careful breeding program that has worked to preserve the Lipizzan breed for over 50 years. Our foals are the future of our performances. The foals of each Spring are featured in our Summer Performances for the opening segment.